I never thought I was prone to accidents or illnesses, but this week has proven me wrong. On Sunday night/Monday morning I don't know what I was sick with, but it felt like some one was stirring my brain like it was in a punchbowl. On Thursday after doing some yard work I had a stabbing pain in my abdomen that was so bad I almost passed out (don't worry it only lasted for a couple of hours, I was fine in time to pick up Aiden). Then on Friday, in a freak accident that I'm convinced could only happen to me, I sliced the bottom of my foot open resulting in a lidocaine shot, a tetanus shot, an antibiotic shot and three stitches. I'm really not looking for pity or sympathy, just letting you all know I'm still alive. 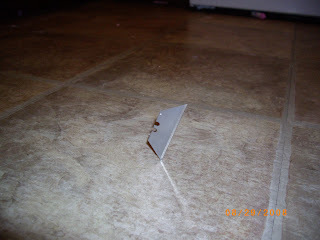 I was putting an envelope that had Chris's video game fixing tools on the top of the cabinets and I guess this sucker fell out and got stuck vertically in the vinyl tile floor. I unknowingly stepped on it. It didn't hurt very much, but I wanted to wash it off so I started hopping to the bathroom. About half way there I noticed that blood wasn't just dripping but streaming out of my foot. Not wanting to make any more of a mess I asked Dalin (the only other person home) to get me a napkin from the table. He went over to the table and realized he couldn't reach the napkins and said, "You do it mommy." Thanks dude! While I was waiting for him a puddle of blood had gathered where I was standing. I made it to the bathtub to rinse it out and called Chris to come home and help me. Dalin did bring me a towel to redeem himself. I was going to try to clean up the blood trail of gore myself, but I didn't want to get any more on the floor and I also wanted Chris to see it so he would know I wasn't overreacting. When Chris got home the first thing he did was take pictures of the mess on the floor. I don't think I'll post them to save those who may have a weak constitution. Before Chris could get it cleaned up, my mom dropped by and saw what looked like a crime scene I'm sure. I am absolutely fine now, it doesn't really hurt and I can even walk pretty well. It's just another injury to add to my embarassing moments. OUCH!!! Holy Cow, Kristen! I'm glad it doesn't hurt too much, but YIKES! Oh man! That stinks! Are you o.k.? That is sad and scary.